The bicycle is a tremendously efficient means of transportation. In fact cycling is more efficient than any other method of travel--including walking! The one billion bicycles in the world are a testament to its effectiveness. The engine for this efficient mode of transport is the human body. Because bodies are fueled by food, diet plays an important role in how the body performs. Different muscle groups and types provide the power. Genetic inheritance, intensive training, and a competitive drive help top athletes push the boundaries of endurance and speed on the bicycle. 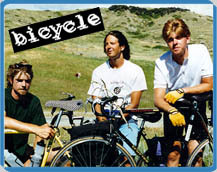 Bicycle is "a band that rolls across the country on bicycles and rocks in towns and cities along the way." Bicycle has been touring the for the last few years. Using special lightweight guitars and a pared-down drum kit, the band hauls their own equipment in bike trailers. On one tour the band covered 200 miles (321 km) in 2 days. "Heavy metal folk rap" is how the New York Times coined the band's sound. You can hear for yourself by clicking on the RealAudio Sound below. You can also visit the band's Web page (available in the "References" section at the bottom of this page) for more information. In the United States many people still consider cycling only a recreation or professional sport. But millions of Americans have found that cycling is a great way to get work or get around town. Some cyclists are banding together and forming organizations and events advocating issues important to cyclists. The bicycle has had a great impact on popular culture as well. In fashion, the bicycle was largely responsible for changing women's clothing in the late 1800s. Restrictive corsets and long dresses made way for bloomers and later trousers. In the art world, the bicycle has made its way into painting and sculpture. Most notably in Marcel Duchamp's Roue de Bicyclette or Bicycle Wheel which is considered the first 'readymade' sculpture. Duchamp's Roue de Bicyclette, the 1951 version. The original, created in 1913, has been lost. Unlike automobiles, which require fossil fuel, cyclists are fueled by food, a renewable energy resource. The type of food a cyclist eats can affect perfomance. All of us require water, protein, carbohydrates, fats, vitamins, and minerals to stay healthy. For top atheletes, maintaining a proper balance of these nuturients is extrememly important. U.S. Women's cross-country champion Ruthie Matthes explained, "Off the bike I tend to eat a lot of vegetables and fruits, high carbohydrates--but not to the extreme of where I'm eating just rice and potatoes. I do mix protein in." During races many cyclists will use high-carbohydrate drinks, bars, or even gels for instant energy. Ruthie Matthes talks about her diet both on and off the bicycle. The human body is made up of mostly water, so even losing as little as 2 percent of the body's fluid through sweat can adversly affect cycling performance. Athletes riding in hot conditions for extended periods need to be careful. Severe dehydration can cause heat exhaustion or heat stroke and in even in some extreme cases, death. Cyclists are instructed to drink a few cups of water before riding and then to drink often during exercise. A cyclist's legs provide the power for cycling. Muscle attached to the thighbone (femur) and the shinbone (tibia) do the majority of the work. Your thighbone works like a lever and if it's longer than your shinbone it will provide extra leverage on each stroke of the pedals. The length of your thighbone is determined by genetics, so if you have short thighbones you can blame your parents. The length of the thighbone is not the whole story, though--it takes muscles to move those bones.